The Standard Code Signing Certificate works with Java Code Signing and Microsoft Authenticode technology. It has been created to sign code digitally (in the mode of user or software kernel-mode). Why should you sign your software with a Code Signing certificate from the CERTUM certification authority? The Standard Code Signing Certificate signes files such as: .exe, .docm, .xlsm, .pptm, .xpi, .jar, war, .ear, .dll, .ocx, .cab, .msi files .sys, .cat, .msp .xpi, ocx, ect. The Standard Code Signing Certificate can be used with: Microsoft, Office, Microsoft Visual Basic, Firefox, iOS, Adobe, Java, ect. 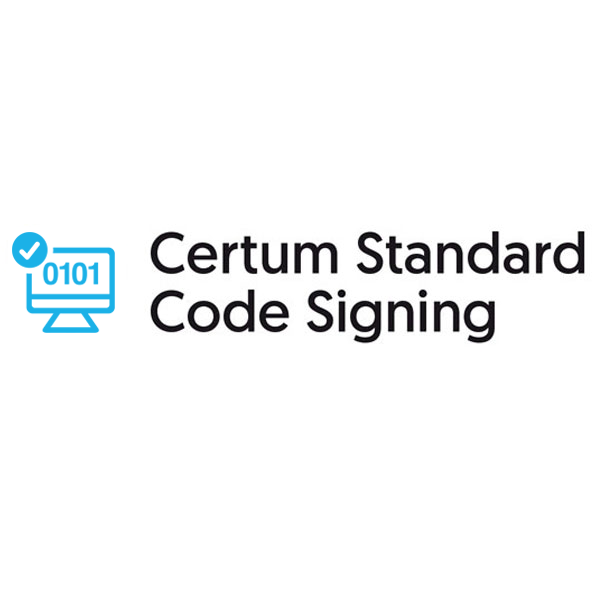 Certum Standard Code Signing Suite contains: USB token combining a smart card reader and a Micro-SD card slot, cryptographic smart card, instructions. Warning. The Standard Code Signing certificate is compatible only with the CryptoCertum 3.2 cryptographic card. The customer has the right to a 30-day trial period for the Code Signing set. In the case the product does not meet the expectations, the customer has the right to exchange the product for another or return it. In the case of returning/exchanging the Code Signing set, the customer shall be obligated to send back the received product without delay, upon prior contact with the Complaints Team at: reklamacje@certum.pl. The product must be returned to: Zespół Reklamacji Asseco Data Systems SA, ul. Bajeczna 13, 71-838 Szczecin. In the case the cryptographic card has been personalized (the card has been given a PIN/PUK number), the amount of the refund will be reduced by the current price of the new cryptographic card from the CERTUM offer. In order to make a return, please contact the Asseco Data Systems SA Complaints Team at the following e-mail address: reklamacje@certum.pl. Detailed information about the complaint procedure can be found at the link: https://en.sklep.certum.pl/terms-and-conditions. The Ev Code Signing Certificate fulfils all the requirements set by Microsoft. Software signed by an Certum EV Code Signing certificate can immediately establish reputation with SmartScreen reputation service even if no prior reputation exists for that publisher or file.